I am no longer afraid of sharks. This was not a fear I ever expected to conquer, and certainly not one I thought I’d beat in London. It was early on a Monday morning in Hackney, and I was clutching my coat shut and stumbling towards the bus stop in a daze. As I waited, a pitiless gray sky pelted me with icy spittle. Shelter came in the form of a big red bus bound for the dead center of the Smoke -- specifically, the London Aquarium. There was a lot of traffic and I was running late, so I opted to ditch early and hoof it across Waterloo Bridge. The Aquarium is in County Hall, which is right on the Thames and directly across the river from Parliament. The rambling Neo-Baroque building formerly served as HQ for the Greater London Council, until Margaret Thatcher abolished the GLC in 1986 and it vacated the premises. Today, County Hall remains mostly empty. The exception is on the first floor, which is where I’m headed to swim with sharks a stone’s throw from Big Ben. For anyone in London to do the same is easy. 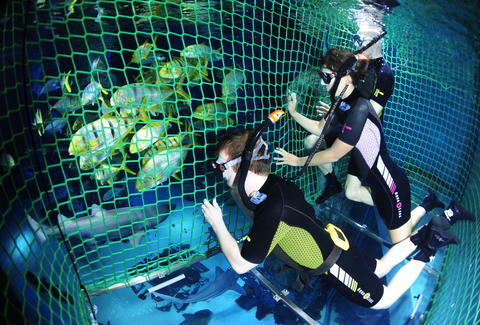 The aquarium hosts three dives into their shark tank a day, seven days a week: at 11.30am, 13.30pm and 15.30pm. No diving experience is required, nor is there a minimum age. You only have to be at least 1.3 metres tall, book it a few weeks in advance, and bring your own towel and swimsuit. As many as four of your friends can join you. For the uninitiated, New Smyrna Beach boasts some of the best breaks on the East coast of the United States. The chief spot is Ponce Inlet, where a jetty creates semi-permanent sand bar that bolsters the incoming swells on its south side. But stagnant sand also means murky water, which sharks really dig (because of how their vision works, they actually see better in grittier shallows). So, in New Smyrna, the sharks are also drawn to Ponce Inlet, where they prowl the shore for something soft to latch onto, and incidentally chomp on surfers on the regular. In fact, that happens more often in New Smyrna than anywhere else on the planet. At 10am I checked in at the Aquarium’s front desk and was taken to a set of spiral stairs near concealed by a heavy black curtain. My only companion was a nice lady named Chloe, who wore a pair of rainboots and teal polo shirt embroidered with the London Aquarium logo. But her real authority was made clear by her broad knowledge of sharks. She smiled at me, then handed over a wet suit, booties, a snorkel and a mask. 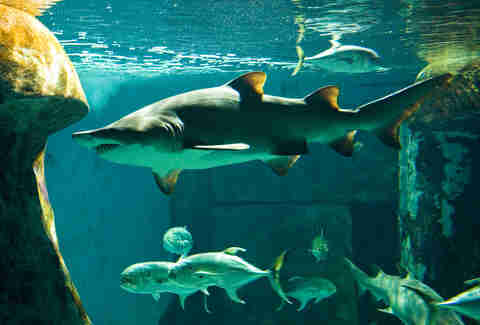 “We have two sand tigers, two Atlantic brown sharks, two black tips, and a grey reef and a nurse shark. Oh, and a bow mouth. Even though it looks like a shark, it’s technically considered to be a ray, like a stingray.” She pointed to it; it could have fooled me. As I stared out into the water, I noticed a rectangular cage that looked roughly the dimensions of a four-door car, and was made of loosely braided nylon rope lashed to a transparent plastic bottom. Looking beyond it, I quickly became transfixed by the dozen or so toothy brutes gliding through the blue, cruising around in vaguely ominous circles. “I’m not scared,” I said, unconvincingly. To be clear, when I say I was afraid of sharks, I don’t mean I had a “phobia,” as that would indicate my feeling bore an irrational tinge -- and I don’t believe it did. I didn’t worry about sharks in an abstract way; they didn’t prevent me from surfing. But seeing one in the water gave me The Fear like nothing else ever has. The thing is, I had (and still have) nothing but respect for sharks. Any animal that survives basically unchanged for 420 million years has damn well earned it. And every year, we humans kill about 100 million sharks. In consideration of that fact -- and that, since 1882, there have only ever been 267 attacks recorded in New Smyrna, the so-called “shark bite capital of the world” -- I’d say we’re the menace. The ocean is plainly theirs. We are merely floppy and ill-suited guests, and I don’t reckon we’re being too polite. But that knowledge would make no difference when I’d see a shark out in the breakers. Each time, I’d feel frigid whips of primordial panic. Something very deep inside me was shaken awake. There was no thought -- just an ancient icy dread that gripped me by the balls. You are on the menu, and you know it. Your surfboard might as well be a Triscuit. Chloe sutured the weight belt around my waist. She handed me a laminated chart with all of the fish and sharks present in the tank, and guided me to a small metallic ladder. I eased myself into the water, and felt myself slowly drift to the bottom of cage. I recognized the blub-blub as air escaped from my snorkel; I held my breath. I did a few breaststrokes to propel myself along the length of the cage, and as I did so a sleek pair of black-tip sharks trolled next to me and scoped me out. I swam back up to the surface, clearing the water from my snorkel with a quick burst of breath. Chloe laughed, but did not answer. I eagerly dove back in. I was entranced by what I saw. There’s a surreal quality to experiencing life underwater. It’s beautiful and strange. You’re in a place more fundamentally foreign than anywhere else you’ve witnessed in nature, or life in general. The rules in the aquatic are so completely different from our own that the animals that thrive within it are alien in an unnerving way. You feel, for lack of a better term, like a fish out of water. Thinking about this, I remember I need air, and kick up to bob on the surface and catch my breath again. Remembering an old trick I learned in Florida, I asked if it would be OK for me to spit on the panes of my goggles to keep them from fogging up. Chloe said it was fine, and assured me that they cleaned them. After 20 or so minutes of being totally engrossed, of watching sharks peacefully swim and finding it strangely soothing (there are actually a ton of studies suggesting that aquariums in general relieve stress), I was lightly tapped on the shoulder and told to hit the showers. As I stepped onto the ladder and out of the water, a new and raw appreciation for the sleek predators that have dominated the ocean for longer than I could ever truly comprehend. I had seen sharks, and I had gotten to join them in their element without The Fear, and this alone felt like a victory of sorts. As a souvenir, Chloe gave me a shark tooth collected from cleaning the bottom of the tank. 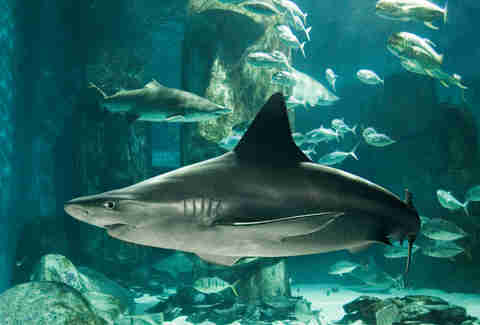 (Sharks’ jaws have an average of 15 rows of teeth, and they lose and replace them often, she said.) I had never felt the serrated edge of a freshly recovered shark tooth -- just ones from the shore that have been worn dull by the brutal lather of the ocean. The one in my palm was startlingly sharp by comparison. 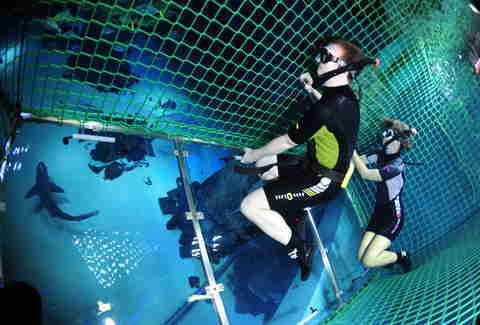 If you’re keen to take a dive with sharks and have your very own epiphany, you can (provided you’ve got time and 130 quid to burn). John Marshall is a London-based writer whose favorite shark is that gnarly 400-year-old one from Greenland. Follow him @brunodionmarshall.